Canning Gear – Second Hand! 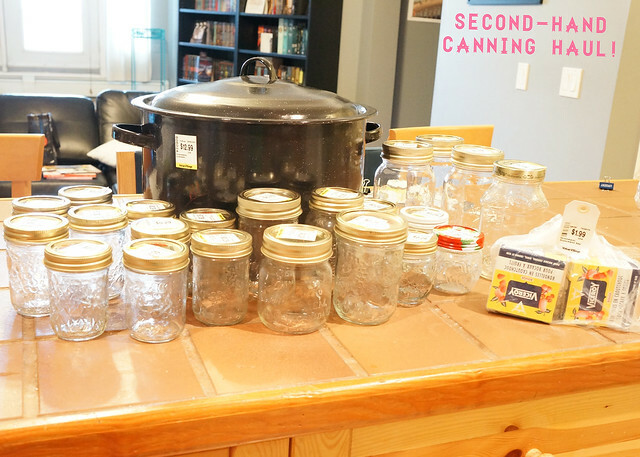 If you think you want to get in to canning your own jams, jellies and salsas, or if that’s your bag already, try checking out second-hand stores! I got the entire haul above for $21. 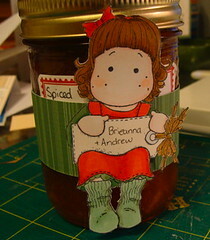 That’s 20 jars, plus a giant canning pot complete with jar lifter inside! Each jar was only $0.29 at Value Village. I’m never buying new again! All the jars are currently running through my dishwasher, along with the ring halves of the lids. 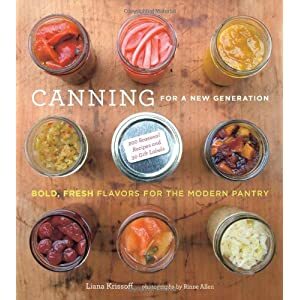 I’ve written about canning a few times, all those posts are here. 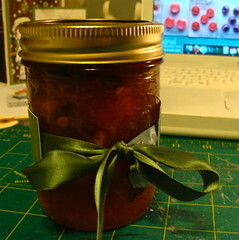 If you are going to buy jars second-hand, never use the flat half of the lid to can your jams. The disc part only seals once, and if you’re buying used, you don’t know what it was used for before it became yours. After it’s been opened it won’t seal properly again. If you want to keep dry goods (rice, spices, paperclips), feel free to use them, but never use them to can again. I save mine so I can store stuff in jars if I want to, but I make sure to mark all used ones with an X in Sharpie so I don’t mix them up with the fresh lids. All I need is a pack or two of lids and I’m ready for the summer canning season! 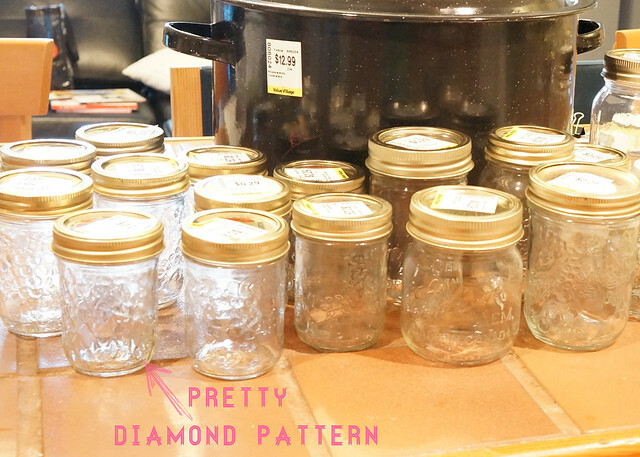 P already complains about the number of jars we have in our pantry…. he’ll thank me when they’re full of plum sauce and mango chutney though. 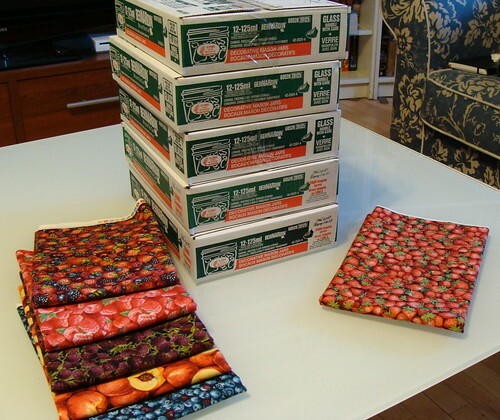 There was only on of my very favourite pattern – the quilted diamonds. Any jam that goes in the few of those jars that I have stays here. I already had a pot I use for the boiling-the-jars part of canning, but this one is huge, plus it has the lifter. My old canning pot may turn into a dye pot sometime soon, so it isn’t a waste! Not that a pot that size for $12.99 is a waste either way. Do you can? You should! 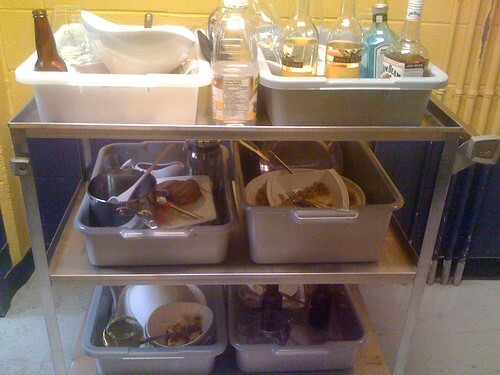 Yup, that’s 6 full bus trays of dishes and assorted bottles. The food was mostly real (with rubber pork chops and cunningly painted styrofoam bacon) and the drinks were mostly various shades of food colouring in water. The white wine was white cranberry juice though. This show also had some other things I didn’t have to clean up – like the box of Cap’n Crunch ceral, and the boxes of pop tarts we went through. * The redeeming part of this job was that although the pop tarts didn’t get eaten, you could tell when they were broken because the little foil packages looked all lumpy and weird, so those ones had to be ‘disposed of’ and new ones set for the next night. 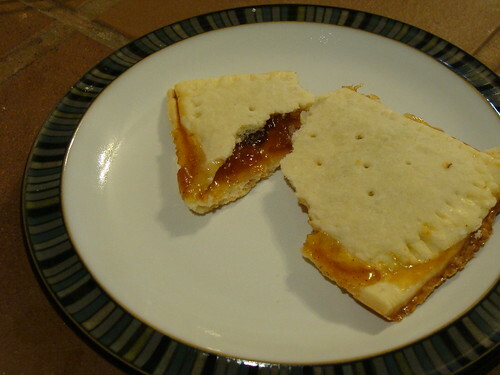 I don’t know that I’d ever eaten a pop tart in my life before that show – I had a very homegrown, homemade diet as a kid, which I am very thankful for. Time came for the potluck for this show – we try to do one on every show, and sometimes there’s a theme. This time the theme was ‘food inspired by the show’, so naturally I knew I had to use Smitten Kitchen’s recipe for homemade poptarts. I made a double batch – one with regular pastry and my own spiced wine peach jam, the other with SK’s suggestion of wholewheat pastry, and a brown sugar & cinnamon filling. They were a hit! Luckily there were enough to go around, so both P and I got to try one of each flavour, plus the ones that broke that the potluck peeps never saw. 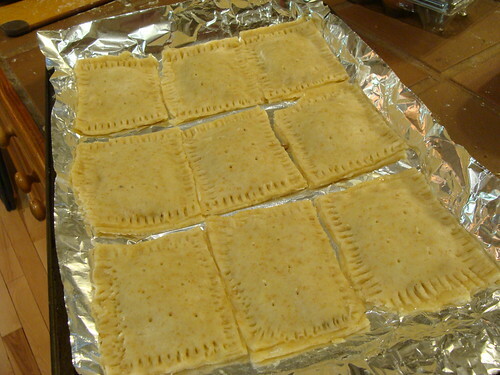 The brown sugar ones were a cinch to get off the pan, the jammy ones were a little messier – a couple of them burst and stuck to the tinfoil, but it all worked out in the end. The credit for actually baking these goes to P – I made the pastry one morning, then though I could assemble and bake them the next morning. I didn’t leave myself quite enough time to bake them all and get to work, so I put P in charge of taking them out of the oven at the right time. I’d say he did an excellent job. 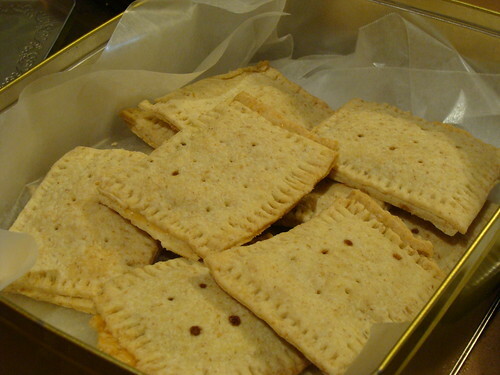 As much as I enjoyed munching on the odd commercial pop tart during the run of this show, it was so much fun to make these, and proves to me yet again that homemade will always be tastier than preservative-filled, HFCS-filled storebought things. Which has more calories? No idea. But I know exactly what went into each of my tarts (really. 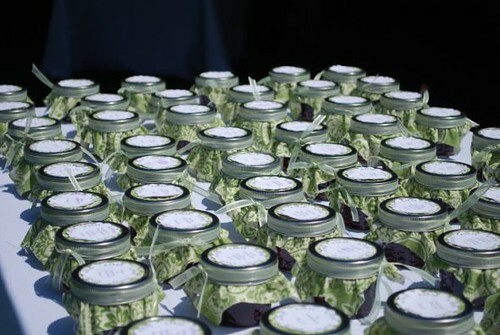 I made the jam, remember?) and I know that I can pronounce every single ingredient, which is what scares me about a lot of pre-made grocery store things. *Amusing side note: one Friday the props department delivered items we were getting low on. I got a shopping bag full of pop tarts, condoms, and joints. ** Party on! **Actually the filling from herbal cigarettes rolled up to look like joints. We’ve all done it – either forgotten about a Christmas party, or decided to go to one at the last minute. Well, today I did the latter. I ran out to the liquor store and bought a bottle of wine, but I decided I wanted to bring a little something else. Mostly because I changed my mind so late about the party, I haven’t RSVP’d. Oops. I thought I’d be more tired than I am right now, it’s not that I didn’t want to go! So I’ve been practicing my Copic colouring, mostly with my Magnolia stamps. This has left me with lots of little Tildas all coloured, with nowhere to go. They’re all cut out and sitting a little dish on my desk. 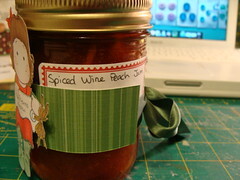 The jam, if anyone is curious, is Spiced Wine Peach jam from my canning frenzy in September. I think this fits the Little Stamp Shoppe’s December challenge of ‘create a gift tag’ – it’s not your traditional ‘tag’ shape, but it certainly fulfills the purpose of a gift tag, namely it gets tied to a gift, with the recipient’s name on. I’m one of those people who is always starting new craft projects. I have supplies for all sorts of crafts in our storage room. I’ve found a new love, but don’t worry, it won’t stop me knitting. My new ‘thing’? Canning. 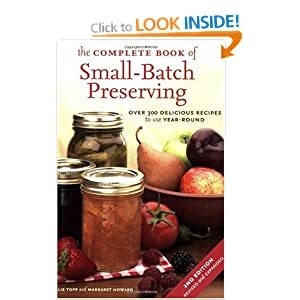 I bought this book: The Complete Book of Small-Batch Preserving: Over 300 Recipes to Use Year-Round and I absolutely love it. 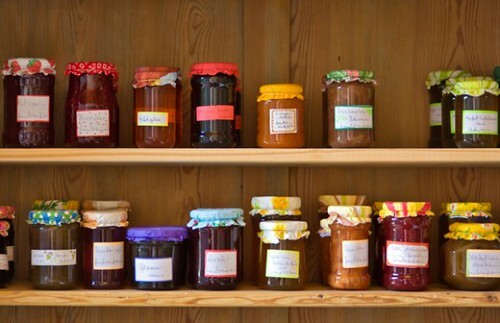 Mum made all our jams & marmalades when I was growing up. We had a lot of fruit on our property, way more than 3 people could eat in one summer. 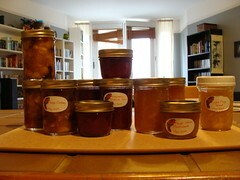 It is something I’ve wanted to do ever since I moved out, but I didn’t want to end up with 10 jars of jam. Buying that much fruit would be expensive, and we don’t eat that much jam. 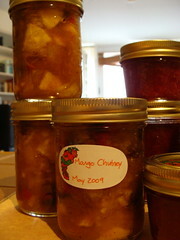 Small-batch preserving is just right! You get a couple jars of jam, which is just right. Soon after I bought the book, but before I’d thought seriously about what to make, I went grocery shopping and found a flat of 12 mangoes for $6. So I bought mangoes. 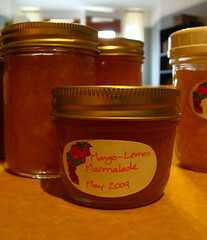 And I made just about every mango recipe in the book. The thing with small-batch is that while you don’t end up with a lot of product (good) it doesn’t use a lot of fruit (sometimes good). 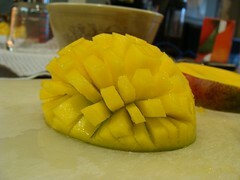 Most recipes call for 2 mangoes. I still have 6 left sitting in the box. 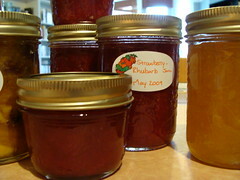 From left to right we have: Mango Chutney, Strawberry-Rhubarb Jam (no mangoes, but I couldn’t help myself), Mango-Lemon Marmalade, Light Mango Spread (I had more than 1 jar of this, but they’ve already gone to new homes!). 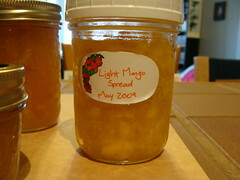 P’s stepdad is a recently-diagnosed diabetic, so the light mango stuff was for him. No added sugar, just Splenda, and a special no-sugar pectin. It gets the plastic lid, because you need to keep it in the fridge or freezer. No sitting on the shelf for 3 months for this one, eat it fast! I’ve been looking at canning books for ages, trying to find one that meshed with what I knew about canning. 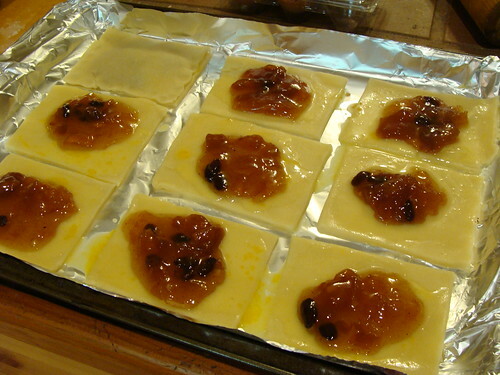 Mum never used pectin in anything, saying that it just diluted the fruit. Look at a pectin recipe vs. a no-pectin one and even if you start with the same amount of fruit, you get much more product from the pectin-using one. Thus, diluted fruit flavour. This book doesn’t use it too much, which is nice. Mum also never boiled the jars once the jam was in. Just put boiling hot jam into hot jars. She boiled the flat part of the lids, to soften the seal, but that was it. Once the lids were on, I’d hang around the kitchen counting the ‘ping!’ noises the lids made as they snapped down to seal. And, no one has ever died or even gotten sick from eating mum’s jam. Some canning books went so overboard on the warnings it just seemed like fear-mongering to me. Small-Batch has you boil the full jars, and I did for these, but I still don’t think it really necessary. Most of these have been done for about a week, and the only thing I’ve tasted (apart from licking the spoon) is the Mango Chutney. I sometimes will finish knitting a sweater or socks or something, and immediately put it away nice and neat where it belongs. I won’t try it on for a while. After I’ve spent so much time on something, I want to enjoy it being completed without realising that it’s too big/forgot a button/too small/etc. I think I’m doing the same thing with this jam. What if it is too runny? Tastes bad? To stiff? I’m just enjoying the pretty jars right now, and telling myself I haven’t had any yet because you need muffins or scones to truly enjoy jam, and I haven’t made any yet. I think I’m going to go make some cornmeal muffins now, and while those are in the oven, I may even sew buttons on the finished $1.50 cardi that’s been folded on the shelf for 2 months now.